Despite WordPress assigning this post as p1198, this is in fact the 777th post! Yes, it's time for another one of our really hated loved Useless Rubenerd Blog Milestones! Given the fact I'm in the 700+ range of posts, there are some posts which have the same number as famous Boeing jetliners. Having nurtured an interest in commercial aviation since I was a kid, I figured I'd create some small posts about these planes. I missed the boat on the 707/720 and 727 (no, I'm sorry the 717 was the MD-95!) but I did do posts on these 7x7s: 3, 4, 5 and 6. Despite the name "Boeing 777", the Boeing 777 was designed by Boeing Commercial Airplanes in response to the then large capacity gap between the 767-300ER and the 747-400. The 777 is currently the world's largest twin engined commercial airliner; in laymen's terms this means its the largest commercial airliner to have more than 2 full-sized engines, but less than 4. It can carry between 283 and 368 passengers in a three-class configuration and has a top range of 17,500 kilometres, or 6,890,314,960.63 inches for those who use the Imperial system. The Boeing 777 was the first airliner to be fully designed on a computer; despite this a smaller ratio of airframes have been involved in catastrophic crashes as compared to other airliners currently flying. In another departure (pun intended) from traditional design, eight airlines were directly involved from the beginning of the project (Cathay Pacific, American, Delta, All Nippon Airways, British Airways, Japan Airlines, Qantas, and United). 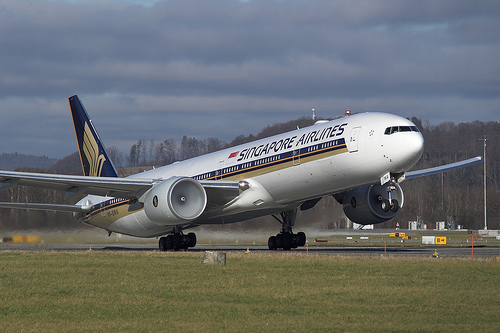 As of May 2008, 56 customers have placed orders for 1,080 777s, with Singapore Airlines being the largest customer; Singapore Airlines of course being the national airline of Singapore, strange though it may seem. You can find out more about the Boeing 777 at their official website.